Uses : The flowers are acrid, anodyne, digestive, constipating, stomachic. It is used for railroad ties and structural timber. 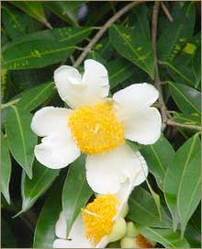 They are useful in conditions like asthma, leprosy, cough, fever, vomiting and impotency. The seed oil is considered to be very useful in conditions like vata and skin diseases. Dried flowers are used for bleeding hemorrhoids and dysentery with mucus. Fresh flowers are useful remedy for itching, nausea, erysipelas, bleeding piles, metrorrhagea, menorrhagea, excessive thirst, and sweating. Oil from the seeds is used for sores, scabies, wounds, and rheumatism.